As smartphone users are likely already aware, app marketplaces like the iOS App Store and the Google Play Store are constantly being filled with loads of free and paid apps and games. Naturally, this means it's easy for lesser-known gems like developer TabTale's puzzler 2 For 2 to disappear in the mix of big-name social media applications and other popular titles. That's a real shame, because 2 For 2 is a rare treat for mobile owners with a casual gaming streak. The game is free, lightweight, and carries with it a simple allure that makes it great for mobile players who aren't ready to dive into lengthy story-driven titles or pay-to-win shenanigans. 2 For 2 is the latest title under the Crazy Labs umbrella, a collection that TabTale defines as a "casual games brand" made in collaboration with independent developers worldwide. Perhaps that's why this newest game shows all of the basic polish and universal appeal that a free-to-play title should have: it has a clean interface, soft and unintrusive music and sound effects, and a gameplay formula that appeals to players of any age. In 2 For 2, players are tasked with matching numbered tiles on a five-by-five grid. Initially, each tile carries a low value number, like two or four, and matching two of these tiles in a line results in a single tile that adds up their values. 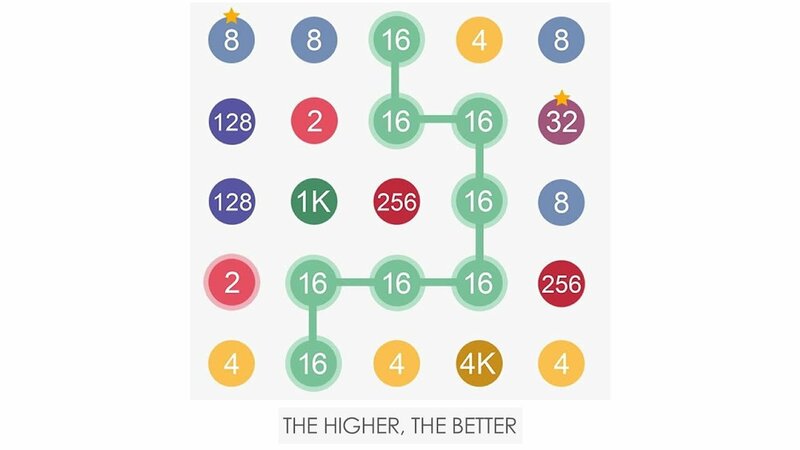 The created value continues to increase with each additional tile in a line, and players can make higher-value tiles by matching up ever-increasing numbers. All of the empty spaces created by destroying tiles, as one might expect, are filled with new number tiles from the top, and games continue until no more moves can be made, in which case, the game is over. Players will spend most of the game with the explicit creating ever-increasing numbers for ever-increasing high scores, and the only limitation to the number created is that it must be an exponential value of two, i.e. four, eight, 16, 32, and so on, all the way up to 1,000 and 2,000. With the potential values of their lines in mind, players have to think about the future lines they intend to make as well as the one they're presently making, as the final tile will be created on the last tile in the chain. Matching numbers together with reckless abandon would result in high-value tiles being scattered across the grid, which would make future matching difficult if not impossible. Though the action itself is likely more difficult to explain than it is to play, there are occasions when matching numbers comes up with a less-than-fortunate result. Fortunately, the game gives players three chances to undo their moves. Beyond that, there are also special abilities players can employ that either remove a specific tile or scramble the tiles on the board. Using these abilities, as well as using the option score multiplier, costs in-game coins. As might be expected, coins can be acquired through basic gameplay or through in-app purchases. 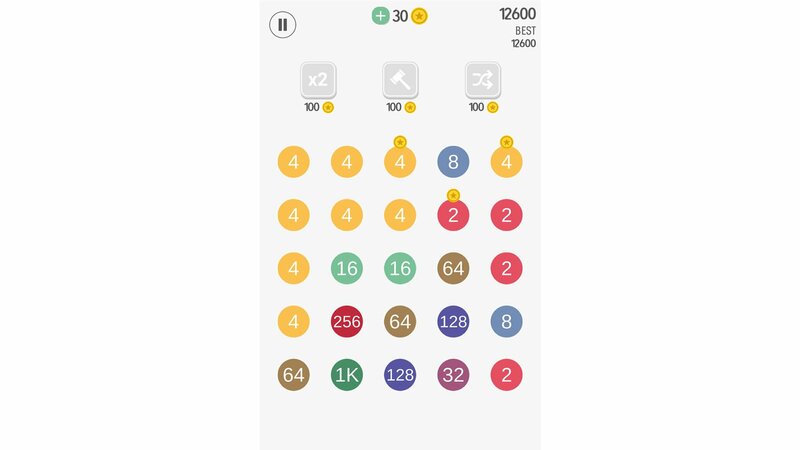 Occasionally, players will see a coin on the grid, and matching a number to the marked tile will pick up the coin. Players who also need a quick boost to make a big play can optionally watch a short video ad to earn a quick 25 coin payoff. This makes for a few easy options, but it shouldn't be relied on too often, as the cost of each powerup doubles each time it's used. Beyond coins and special abilities, 2 For 2 doesn't offer many more thrills. The game does include a variety of skins, each of which is given a title like Modern, Mountain, Winter, Loneliness, and "Sky without men," that can be purchased using 100 coins. It also includes various achivements through Android's Google Play functions for hitting milestone numbers like 256 up to 16,000, and players can compare their scores with the scores of their friends through the Leaderboard option. With consideration to its free-to-play foundation, 2 For 2 is about as good a game as any other. It isn't going to wow players with graphical prowess, plot-based intrigue, or loads of unlockables, but it achieves what it sets out to do in proper style. It's engaging to play, matches can last anywhere from minutes to hours, and players can pick up their previous progress at any time in the totally-plausible chance that they have to set down their phone and tend to real-world matters. In essence, 2 For 2 is the perfect puzzle game to fill those random spaces in time we all seem to encounter, and a rare treat amid an ever-expanding free-to-play games market. Players can find it over on the iOS App Store and Google Play Store. 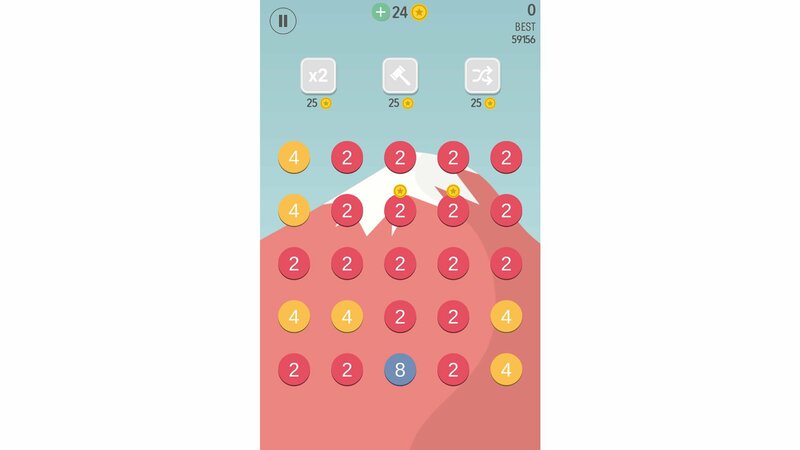 Simple, addictive gameplay Can be seriously addictive.